1. 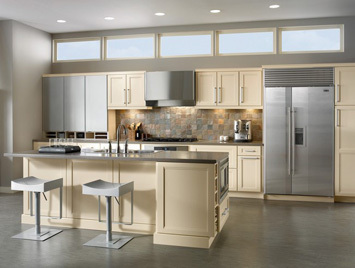 Cabinets: The trend here is definitely fresh and simple cabinets with a modern look and feel. As a more affordable option, some people are refinishing their existing cabinetry to try and achieve that updated feel. 2. Countertops: While beautiful and durable granite is still a favorite, there is another strong, nonporous material called Caesarstone that is quite popular. Caesarstone is a quartz composite (93% quartz) that is resistant to stains, scratches and heat, and also doesn’t need sealing. In comes in a wide variety of colors, uses recycled material, and is easy to clean. 3. Backsplashes: When using granite or Caesarstone countertops, a natural stone or tile mosaic backsplash is an excellent compliment. They add texture and an extra visual component. Many of the more modern kitchens are using a glass backsplash to finish off a clean, polished look. 4. Sinks: The most popular current trend in sinks right now is the deep, single bowl. While the single-bowl size is large enough to accommodate pots and pans, people are utilizing fitted strainers and dish drains to maintain the benefit of a double sink. As for materials, stainless and quartz composites are popular for the bowl, while satin nickel is still most popular for the fixtures. 5. Color: To create the sophisticated modern look in the kitchen that works well with the natural stone of countertops and backsplashes, we are seeing a lot of charcoal shades, along with black and white. 6. Bathrooms: This next year will see many people knocking down walls and expanding their bathrooms to create that luxurious spa environment. It will continue to be popular to either rip out the tub to build a large walk-in shower or create separate tub and shower areas altogether. Other popular upgrades include double vanities and separate water closets. 7. Flooring: Pre-finished wood flooring is a popular trend as it offers a durable finish, easy installation, and come in a variety of colors, designs and textures. 8. Universal Design: The idea of universal design is to create a home that is customized to accommodate everyone living in it. This includes kitchen and bath upgrades to increase functionality and in general, knocking down walls to create a roomier, open, communal living space. 9. Green homes: 2015 will continue to see homeowners opting for a living space that is free of toxins and chemicals. Additionally, people are also becoming more and more energy-conscious which is reflected in the move towards energy-efficient appliances, materials, and designs. 10. Outdoor space: Not only are we seeing all of the above upgrades and additions to the houses themselves, but this next year will continue to see a growing focus on the outdoor space. This includes outdoor fireplaces, livable-screened porches, and luxurious eating and socializing areas. These are just a few of the trends that we anticipate seeing continue and expanding into 2015. Does your kitchen need an upgrade? Are you looking to remodel part of your home to increase its resale value? Good news, homeowners, you will probably recoup 74-83 percent of the cost when you upgrade your kitchen. According to the annual cost versus value report for home remodeling found that a kitchen upgrade costs an average of $18,856 to $54,909; however, you can recover up to $40,000. Plus, in the past year, the value of a kitchen remodel increased by 7 percent, translates to an additional $2,000 return on investment for homeowners. All of this data points to one conclusion: whether you’re making minor upgrades or breaking out the sledgehammer for a complete overhaul, 2014 is a great year to remodel your kitchen. 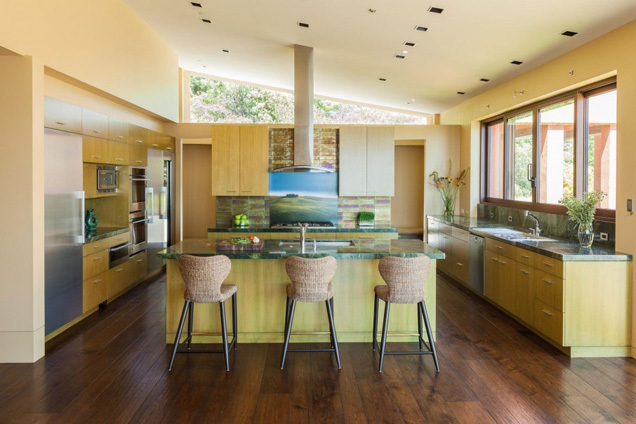 We asked 25 top kitchen designers in America what are the most common trends they noticed in kitchen remodeling for 2014 and compiled this guide. Below you’ll find the most popular responses in each category. The kitchen sink gets a bad rap; people associate it with germs and dirty dishes, but it has quickly become one of the most popular upgrades when homeowners start remodeling. 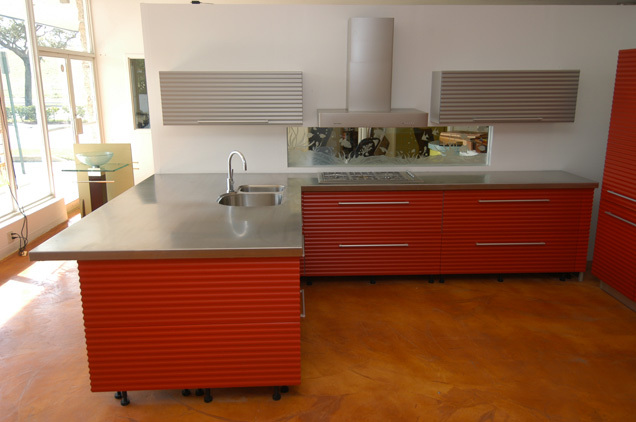 In 2014, stainless steel is out, non-traditional materials are in. A beautiful, trendy kitchen sink not only complements a well-designed kitchen, but is also the foundation of function for cooks — everything from preparation to clean-up happens at the sink. A good sink has counter space on both sides, so the drying assembly line has ample room to work. The following trending sinks fit different people with different tastes and lifestyles. One (or even a few) of these sink trends could inspire your next remodel! Many home cooks are ditching the standard two-basin sink for something more functional — the single basin sink. These sinks are typically the same size as a sink with two basins, which means there’s more cleaning room. You’ll now have the space shuck corn, clean the catch of the day, and wash berries to create the perfect summer meal. 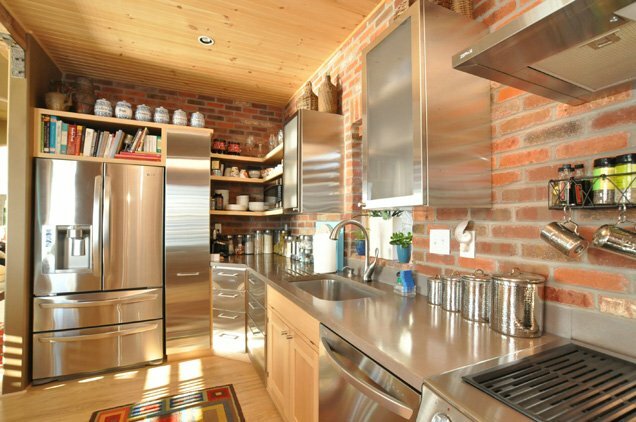 If stainless steel isn’t in style, what is? 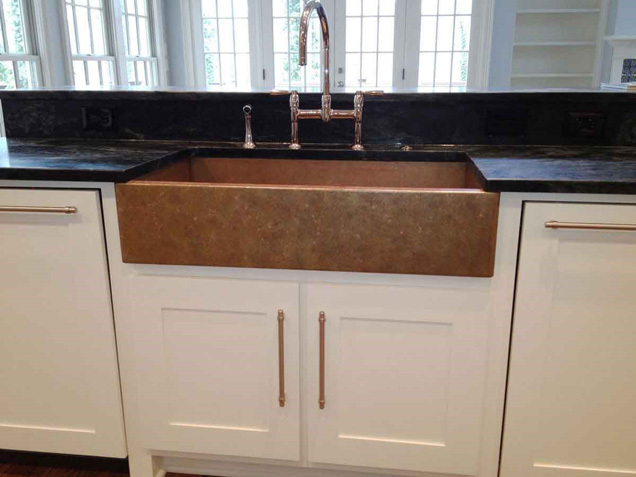 More homeowners are opting for copper or brass kitchen sinks. Often, this trend pairs well with the rustic farmhouse look that many homebuilders and trend-setters are opting for. The different color of copper makes it a popular choice. You can choose a sink that looks like a new penny, or opt for a dark, antique color. For a minor remodel, leave your current sink, but change the faucets to a complementary brass color. An integrated sink is made of the same materials found on your countertop, giving a sense of continuity with the rest of your counter. This design is a great option for homeowners who want to replace their countertops as well as their sink, and want a smooth, unified look. This also gives the homeowner flexibility with materials, allowing them to select from quartz, marble, and everything in between. 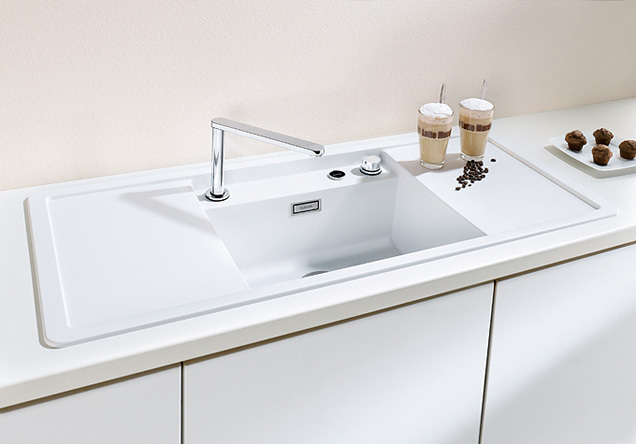 For those who love a modern, sleek look in their kitchen, choose an integrated sink. It makes your kitchen look high-end, but the cost won’t reflect that. Because this seamless design doesn’t create dips or crevices between the sink and the counter, there’s less room for gunk, dirt, rust, or mold to build up around the sink. If one sink is good, two must be great! Prep sinks are becoming an increasingly popular choice. A prep sink offers more flexibility and space to budding chefs who can leave washed fruits and vegetables in it – conveniently near the stove – while dirty dishes rest in the main one. Prep sinks also allow designers to get creative with sizes and shapes. 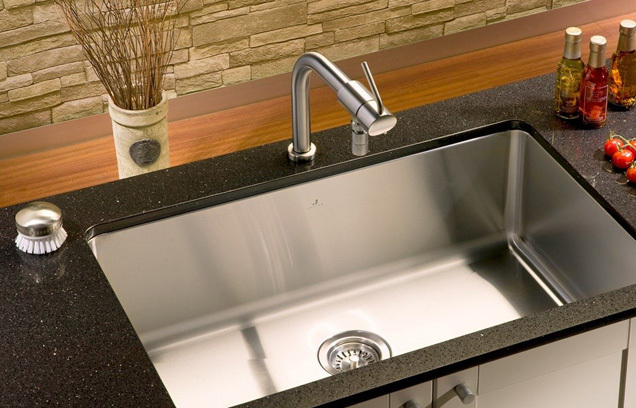 Many people opt for a non-traditional shape, like a crescent or oval, for their prep sink; it’s a small, creative touch that all of your neighbors will be jealous of. 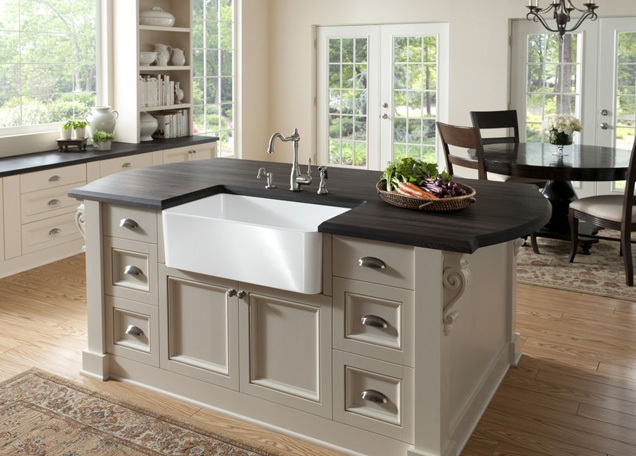 For a quaint finish to a charming kitchen, choose an apron-front sink. These sinks harken back to a quieter time. They’re sometimes described as farmhouse sinks as well. The basins sit lower than the counter and the front ends protrude off the cabinetry. The lower level makes it easier to clean and prep in the kitchen, because you can get closer to the sink. This country-style sink combines aesthetics and functionality. Look for it in classic materials like porcelain, stainless steel, and copper. If one of the increasingly popular sink trends is integration with the countertops, then choosing the right material is twice as important. 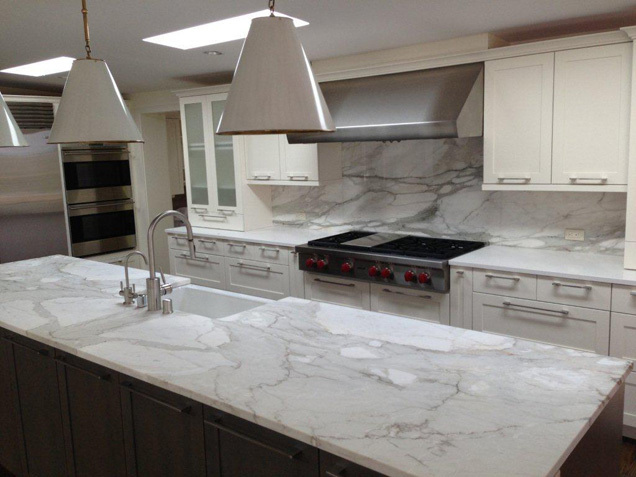 Skip the tile and go right for the meat: heavy stones like granite, marble, and soapstone are en vogue this year. Decorators have started branching out into different stone types to work with the budgets and style preferences of home remodelers. While quartz and soapstone provide clean finishes, engineered stone is stain resistant, durable, and environmentally friendly. 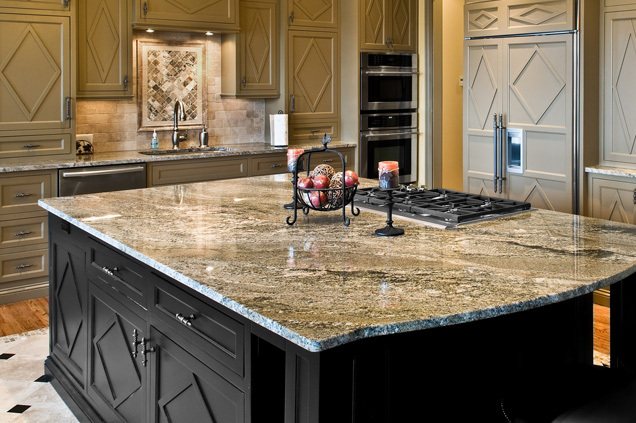 If you’re not afraid of heavy lifting, choose a heavy stone to set your countertops. 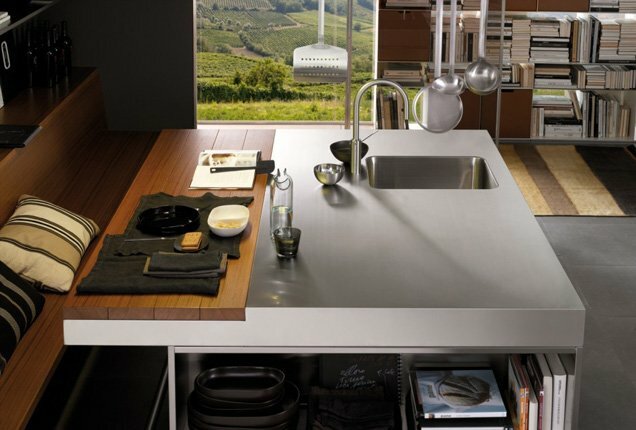 Stainless steel sinks by themselves are out, but integrated stainless steel sinks and countertops give your home a restaurant feel. These are one of the most durable countertop options, even though they can scratch and dent under pressure, and the reflection makes your kitchen appear larger. Choose this option if you’re looking to remodel your kitchen to sell your home; it’ll look large and modern, which is exactly what homebuyers look for. If you don’t want to go with granite and other heavy stones, another popular trend is Butcher’s wood. Butcher block is made of straight cuts of wood that are glued together for increased sturdiness. While these countertops require more maintenance than granite, they can be made to match or compliment your hardwood floors. They also come in a variety of wood including cherry, maple, and bamboo. 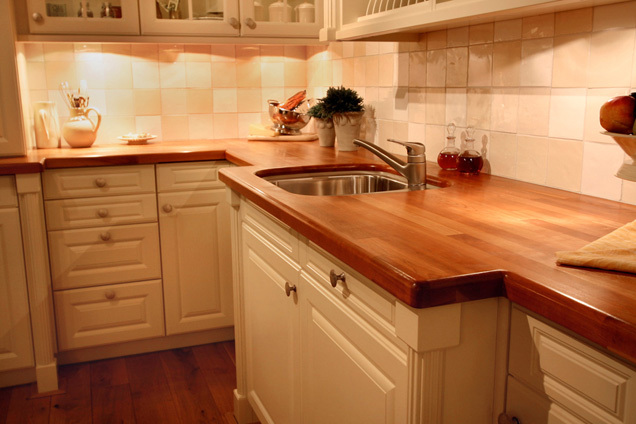 Wood is always in, and it’s the second most popular kitchen flooring choice after ceramic tile. In 2014, many designers are watching this material gun for first. 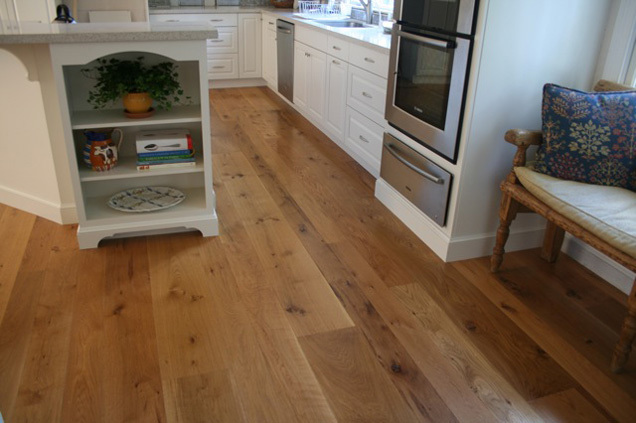 Two of the fastest growing wood choices for kitchen flooring in 2014 are bamboo and reclaimed wood. Bamboo is actually sturdier than most woods, especially engineered bamboo, and it grows twice as fast as most other wood options. Reclaimed wood comes from antique beams and old logs salvaged from rivers. 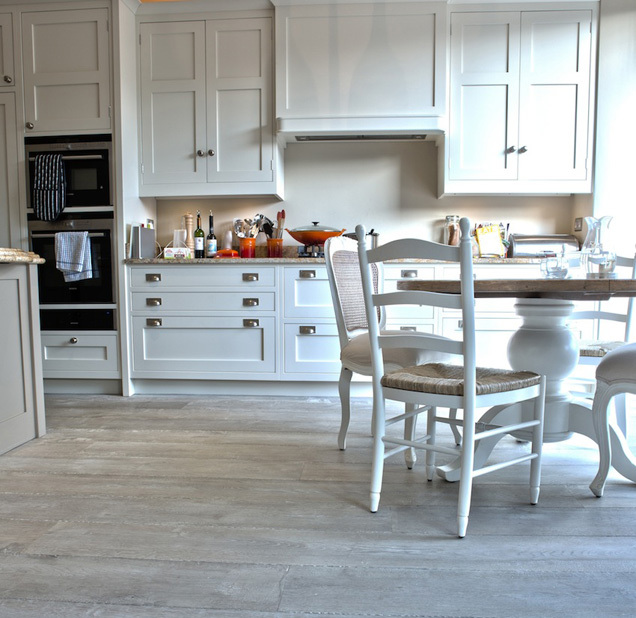 With more designers opting for a rustic feel, it makes sense that this flooring choice is popular. Ideal plank length is seven inches with an ideal width of six feet. Wider and longer planks of wood make a space look larger and smoother. Smooth wooden floors paired with flat (tile-free) countertops are one way to give your kitchen a finished look by just changing two elements. 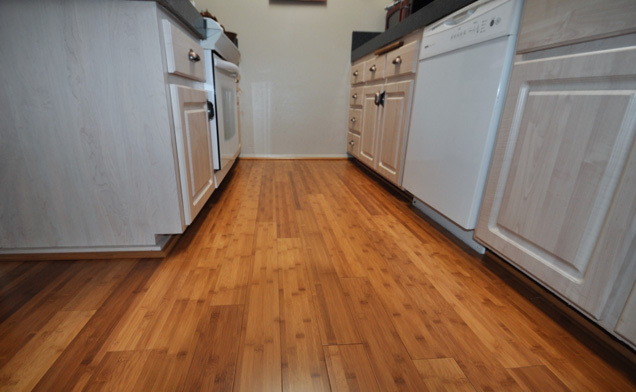 You can use your hardwood flooring to anchor down your kitchen or lighten the room to contrast dark countertops. Different wood choices – from bright blonde woods to soft greys – turn your flooring into a statement piece. Hardwood floors aren’t something to be ignored; they’re a feature element. Backsplashes go in and out of style faster than other kitchen trends, but with a little elbow grease, it’s possible to stay up-to date on trends without breaking your bank. Check out these trends for 2014. If you haven’t picked up on this trend already, the rustic farmhouse look is back with reclaimed wood and copper sinks. To add this element to your backsplashes, choose the rustic brick look. Brick is a challenge to install but will stay in style for several years. When done right, guests will ask if it’s the original brick from the building, even if you have a stucco home. If you still want to incorporate tile into your kitchen without using it on the countertops or floor, then consider tiling your backsplash. This small space increases your options for size and color as you can create a water look with tiny blue squares or add an element of sand with large tan planks. 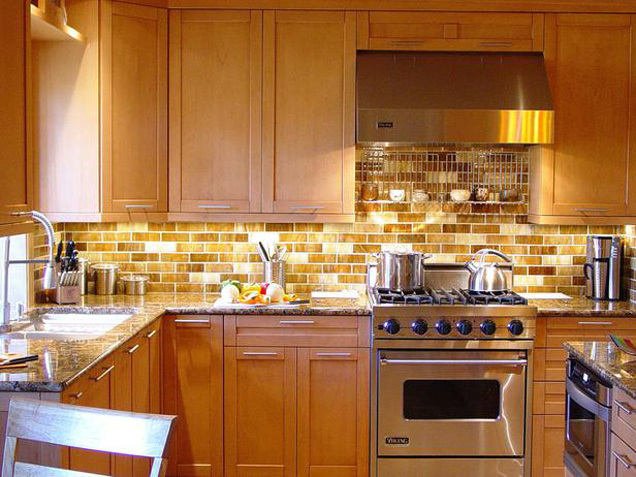 Whatever element you’re missing in your major renovations, you can find in your backsplash. Be careful with this. If you have an incorporated sink that matches your countertops and you continue using marble or engineered stone for your backsplash, everything could start to blend together. Matching the backsplash to the countertops works well if there are enough differentiating elements – like the cabinets, stove, and flooring – to give each element its own flavor. There’s an app for that! Chefs and tech geeks are coming together to incorporate smart technology into the kitchen. While many of the innovations are far from ready for public distribution, there are a few upgrades that can easily increase the value of your home. There’s so much your refrigerator can do before you even open it. Smart refrigerators cost between $1,700 and $3,600; they come with an 8-inch LCD display that’s Wi-Fi enabled and comes with its own set of apps. 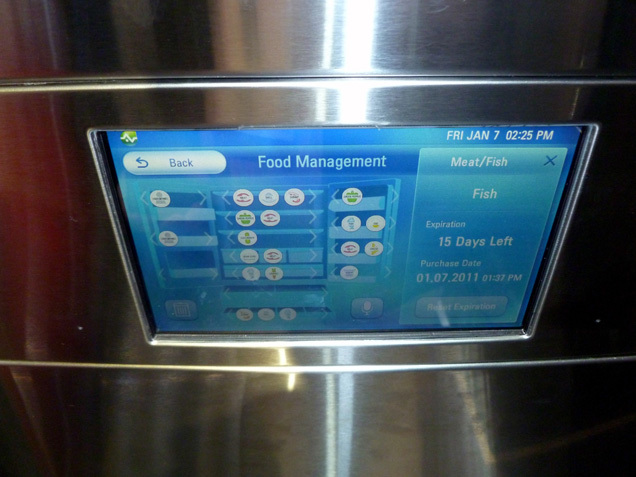 These refrigerators can display photos, leave memos, create grocery lists, check the weather, and browse recipes based on the contents inside. Not only is it a fun tool to play with, but it also reduces the clutter of attaching memos and lists to your refrigerator. Homeowners looking to make small changes to upgrade the value of their home before placing it on the market should consider upgrading to USB wall sockets. 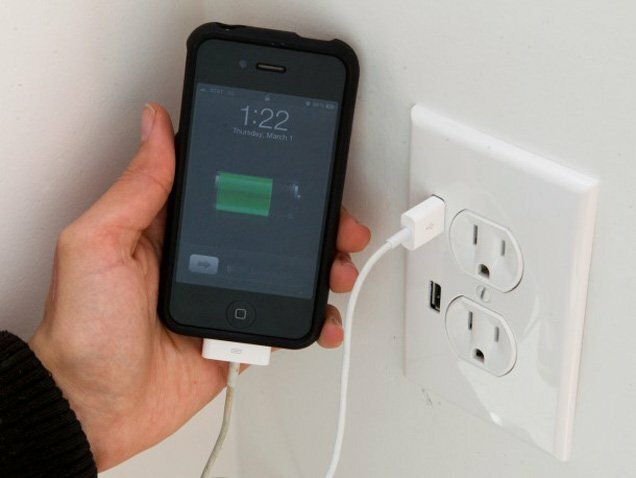 Each socket costs about $30 and comes with two USB ports along with traditional wall plugs. Anything that charges when plugged in through a USB can go right into the wall; no adapter necessary. This is a smaller device that costs about $150, although it’s more of a gadget than an “upgrade” in the strictest sense of the word. The Prep Pad measures the appropriate serving size for the food and displays nutritional value and percent of your daily diet on your iPad. In layman’s terms, it’s a smart cutting board. Going green is always in style. Here are a few modern ways to decrease your impact on the environment through your kitchen remodel decisions. Paint is made up of VOCs, or Volatile Organic Compounds; these compounds keep the ingredients blended but have the nasty habit of releasing into the air when paint is applied. When combined with other pollutants, VOCs create smog. Look for low-VOC paint (with 50 g/L) or certified green paint with zero VOCs. Not only are you helping the environment, you’re also keeping the air inside of your home clean. We’ve touched on recycled materials a bit throughout this guide, with reclaimed wood and bamboo as obvious eco-friendly materials. 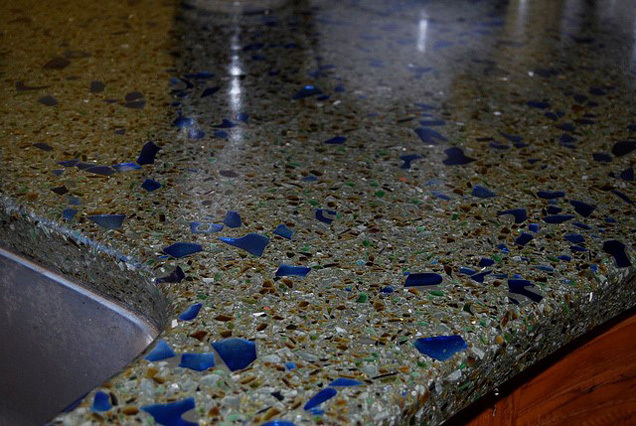 However, there are other options like 85 percent recycled glass and Squak Mountain Stone made up of recycled paper, recycled glass, and low-carbon cement. Remember, knowledge is power. Ask where the materials came from and what they’re made of before you buy them. You probably know to look for Energy Star appliances, but do you know how the EPA awards that label? The product must contribute to significant energy savings nationwide and provide the same performance as its less-efficient counterpart. Also, if the product costs more, the consumer must be able to make up the cost through decreased utility bills within a small period of time. This means that it’s worth paying more for an Energy Star appliance, because you’re guaranteed to get your extra cost back. Designers are thinking outside the box to make cooking easier with unique kitchen cabinets, from built-in space racks to roll-out trays. The name of the game in 2014 is efficiency. 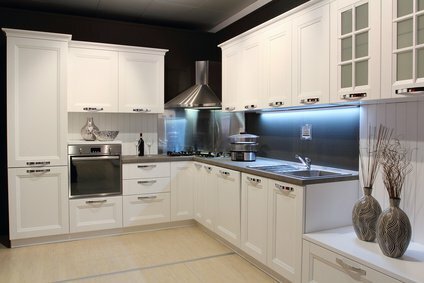 Instead of building a kitchen with cookie-cutter cabinets that can’t fit anything, consider trendier specialty cabinets. 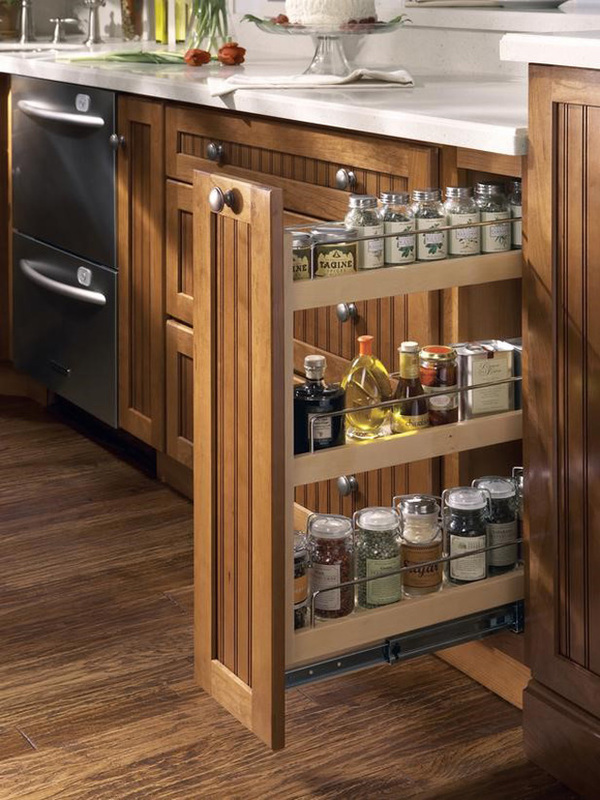 Look into hidden storage options like spice racks, inserts for hanging pots and pans, and multi-layered pull-outs for dry goods. This option is better for homeowners who aren’t planning to sell for a long time, as you can create the perfect layout and grab any gadget or tool you need on a moment’s notice. 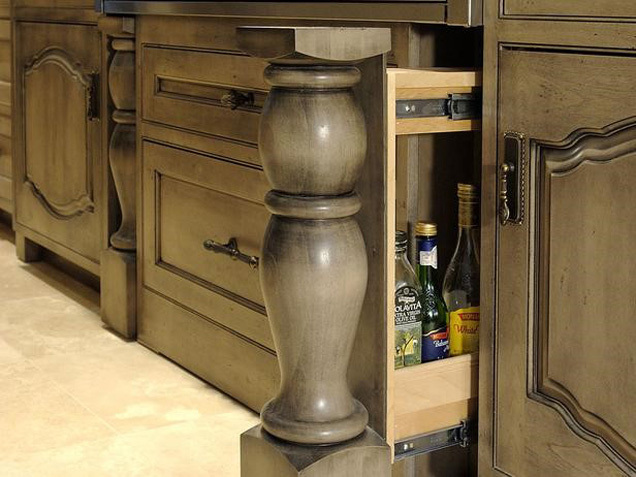 You can also add built-in dividers to drawers to organize silverware and cooking utensils. These drawers keep more clutter off your counters and hide it away in an organized fashion. Popular finish choices for 2014 include – you guessed it – aged and distressed. 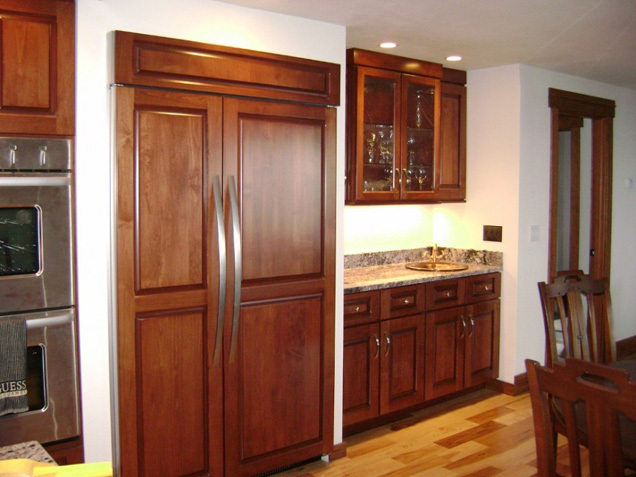 Choose a cabinet finish that complements, but doesn’t match your floors and countertops. A distressed look is created when parts of the finish are rubbed away to expose the wood underneath, and they’re then refinished with a glaze to darken all of the grooves. Pair distressed cabinets with a subtle marble or wood countertop and an integrated or apron-front sink. This style is both rustic and classic, and will handle wear and tear better than perfectly finished cabinets. Your cabinets are distressed, but you won’t be! Instead of a wood finish, some people are grabbing a brush and adding a splash of color on their kitchen cabinets. Pastel blues complement the browns from your flooring, while a spicy red warms up the room. One trend that we’ve seen more of is painting kitchen cabinets two different colors. For example, designers are painting the doors a different color than the trim or painting the top cabinets a lighter color than the bottom ones. 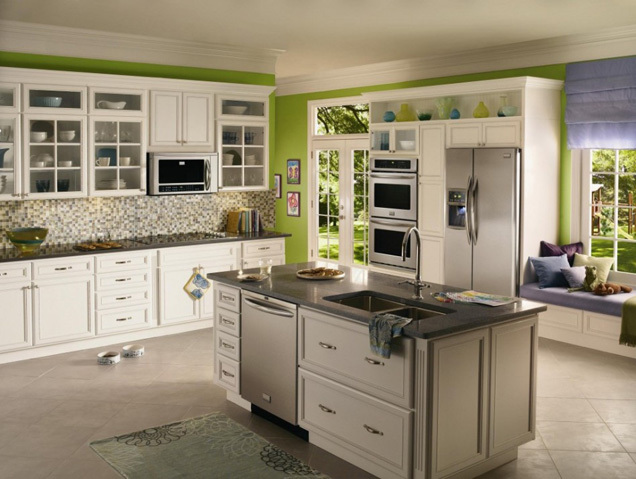 Because cabinets occupy most of your kitchen wall space, think of your cabinet designs like your wall color. They will affect the mood of the room and the way natural and artificial light fills the space. What feels do you want to evoke in your design? Aesthetic is important, but if your appliances are broken or outdated, you won’t spend much time in your beautiful kitchen. 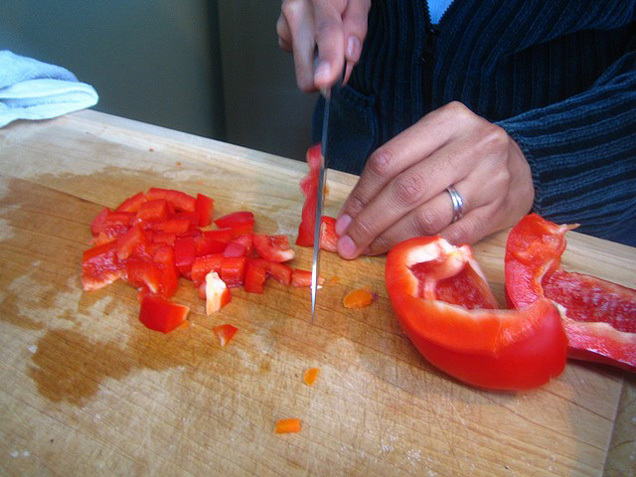 In 2014, homeowners are choosing restaurant-quality appliances. After all, everyone wants to be Gordon Ramsey in the confines of their home. 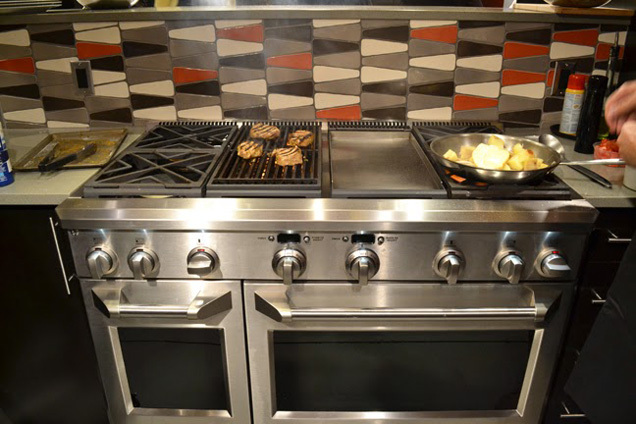 If you’re embracing the stainless steel design, then a chef’s stove is a must. In fact, 50 percent of homeowners said it was their dream kitchen appliance. These stoves can handle woks, griddles, and everything in between. Installing a professional grade stove means you’ll never blame the appliance for ruining your food. This one goes hand in hand with the prep sinks we discussed earlier. If you’re making a full Thanksgiving dinner, you can’t fit the turkey and the pumpkin pie in the same oven. 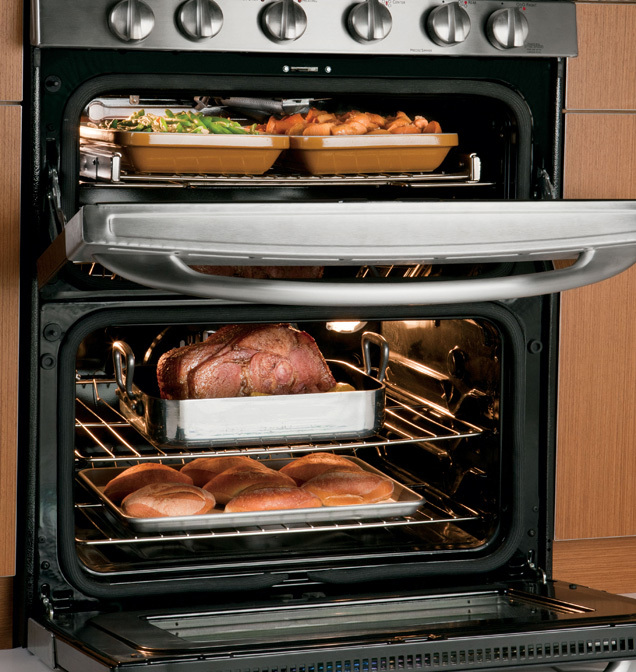 Double ovens give you more space, options, and flexibility to create perfect meals. We’ve already touched on Wi-Fi refrigerators, but what about their design patterns? Some prefer to stick with the stainless steel, but designers tend to be split between hiding their refrigerators behind cabinet wood paneling or making them a focal point by choosing one in a non-conventional color like red. In short, Instead of a bulky white or silver box, people are opting for furniture-like appliances that match their designs. While stainless steel dishwashers are always going to be highly sought-after, many other dishwasher trends are beginning to make waves. For people looking to create a seamless look throughout their house with an integrated sink and a hidden refrigerator, they’re choosing a dishwasher that will also blend in with their cabinetry. The standard one-size-fits-all dishwasher is quickly becoming a thing of the past. Many homeowners are choosing to fit double dishwashers into their kitchens. These dishwashers have full separate compartments that can run at different times. They let you wash delicate crystal and heavily soiled baking dishes separately. There’s also in-sink dishwashers that let you run a small load in half the time it takes to clean them normally. Many internal dimensions are changing as well. Some dishwashers now allow for taller pots and pans on the inside while the outside remains the same size as a standard washer. 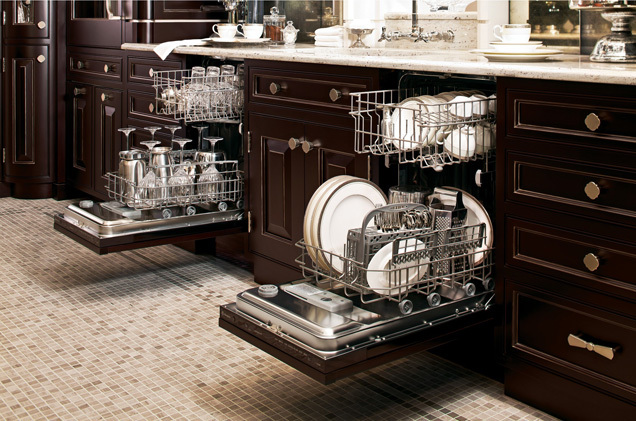 Many people are also looking for more noise regulated dishwashers since more homes are embracing the open concept. No one wants to hear the noisy dishwasher while they unwind in the living room after a big meal. Rustic and hyper-modern are two common trends in 2014. Homeowners are either investing in smart appliances and stainless steel restaurant-grade everything, or they’re going back to their roots with copper sinks and reclaimed wood. 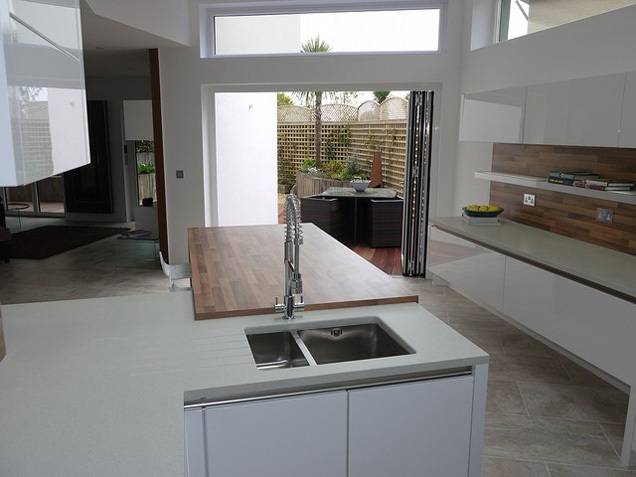 This combination has actually created a third option: the transitional kitchen, which walks the line between the two. Which of these trends do you like? Do you love the look of copper? Does aged wood make you feel distressed? Your remodeling choices will keep a trend going or make it die, so tell us what works and what doesn’t! Whichever path you choose to take, make sure it’s something you love. After all, you probably spend a lot of time in the kitchen.